Rabbis Censuring Councilman David Greenfield Pro-Abortion Vote | RabbiLevin.com - Fighting for Morality! On March 2, 011 Ultra Orthodox Greenfield voted with liberal NYC Council Members to in effect neuter the effectiveness of crisis pregnancy centers, which saved 40,000 (!) pre-born babies since their inception! SHAME ON GREENFIELD!!! 927 Fifty First Street, Brooklyn, New York 11219-3317 U.S.A.
Councilman Greenfield Defies His G-d and His Constituents with His Pro-Abortion Vote; We Demand A Retraction Or Else! Earlier this week, the Rabbinical Alliance of America expressed their outrage at Councilman David Greenfield of Boro Park, for joining with ultra-Liberals to pass measure 371 which will in effect increase abortions in the city by “handcuffing” pro-life crisis pregnancy centers. The Alliance is a 70 year old national Rabbinic organization (Igud Harabonim) consisting of over 850 Rabbis scores of whom reside in New York & Brooklyn. Rabbi Yehuda Levin, Rabbinical Alliance Spokesman stated: “Every Orthodox Jew knows that abortion on demand with the rarest of exceptions (such as life of the mother) is prohibited in the strongest terms. Thus, for Greenfield to represent one of the largest Orthodox constituencies outside of Israel, and reject his own Orthodox upbringing and the will of his Torah adhering constituents is a mega scandal. Which Rabbi permitted him to vote for something that the Talmud and Maimonides rule may be the equivalent of murder? Is Greenfield representing Greenwich Village or Boro Park? When Mr. Greenfield did not actively support a tax abatement for Moisha’s Supermarket, we were quiet. When Mr. Greenfield did not support funding various organizations in Boro Park, we were silent. We are a Rabbinic organization and try to stay out of local politics. But when David Greenfield, a newcomer office holder, has the “chutzpah” to do what no local Orthodox office holder would do, stand our Torah Right to Life mandate on its head, we dare not countenance his desecration of our G-d’s values. It’s bad enough we suffer the pain of having irreligious Jews like Councilman Lander or Israel vote for more abortion/pre born baby killing, should we allow Greenfield to burnish his Liberal credentials, or curry favor with the radical city Council leadership at the expense of our most basic moral values? We say absolutely not! Should Greenfield try to rationalize that he voted as a quid pro-quo to obtain support for other community needs, we declare: Don’t support our community, through the blood of innocent babies. That’s blood money. 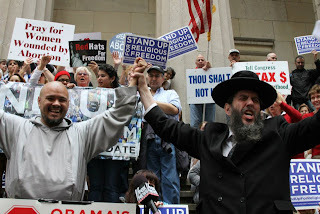 If Councilman Greenfield does not publicly retract and denounce his own vote and publicly pledge to consult and abide by the advice of a prominent coalition of communal Rabbis, with regard to any legislation which touches upon morality, many constituents will begin now to look for an alternative City Councilman. We respectfully but urgently call upon the Torah leadership of Boro Park and New York (Chilul Hashem recognizes no boundaries) to reign in David Greenfield and assure this never happens again. We respectfully address our plea to the following Rabonim and Organizations: The esteemed Bobover and Satmar Rabbeim, Agudah, the Hisachdus, the Novominsker Rebbe, the Skulener Rebbe, the Tosher Dayan, the Karlsburger Rav, Rav Bick, and every other Rav and Askan who is concerned with Kovod Shomayim and morality. Simply put, we are seeing the growth of a politician who represents a danger to us. Now is the time to deal with him and put him in his place. If 41% of pregnancy are aborted because they are unwanted, the solution is to prevent unwanted pregnancies; not to demand that unwanted babies be born. You should be advocating for responsible family planning and better access to birth control.